St Andrews will become carbon neutral after the six turbines are built at Kenly. 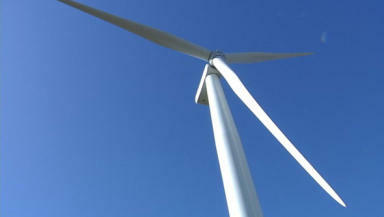 A university has been given the green light to build a wind farm despite objections from some local residents. With a potential output of 12.3 megawatts, the six 100m turbines which the University of St Andrews intends to build at Kenly would make it Britain's first carbon neutral university. A spokesman said: "Our energy bill is £5,000,000. This is a big step towards enabling us to generate our own significant renewable energy. It means we can reduce our energy bills so it's a big step forward in that direction. " Fife Council threw the plan out but now a Scottish Government reporter has upheld the university's appeal. In his ruling, the reporter wrote: "I find that the proposed development would help to deliver a low/zero carbon future and contribute to Scottish Government energy targets. "There would be some visual impacts of significance along the B9131 and minor roads, and from a few properties within two kilometres. However, no significant impacts to communities, the built or natural environment would occur. "Overall, the turbines would be prominent from some viewpoints but would be appropriately sited to minimise landscape and visual impacts." Objectors say that with 97 homes within two kilometres of the site, the turbines will mean an overbearing visual impact, noise and shadow flicker for many. Campaigners are now considering a legal challenge. A spokesman said: "We're all devastated, quite devastated, at this decision. "We really thought the reporter wouldn't pass it because it's so out of keeping with the landscape. It's going to ruin a tourist area. It's just heart breaking." The university will have to meet 40 conditions imposed by the reporter but they hope the wind farm will be up and running in three years.